I woke up and decided to force myself to make a card. I checked out what todays sketch challenge at SCS was and gave it a shot. I love this elegent color combo for a wedding. I believe it is the hot trendy “in” colors to have. I just finished up a wedding invite package for dear friends of mine and this is their wedding colors. So, I made this card to give to them on their special day. STAMP SET USED: Fun & Fast Notes (which I hardly ever use..lol but it turned out so cute on this card). CARDSTOCK USED: Night of Navy, Close to Cocoa, Soft Sky, Shimmery White, Soft Sky Prints DSP. ACCESSORIES: Pretties Kit, Aqua-Painter, Stampin’ Sponges, 3/16″ Corner Rounder Punch, Navy Satin Ribbon from Michael’s. Yay – glad you’re feeling better. And yeah, I love this color combo too – it’s a color I considered (and I guess still am) for my upcoming wedding. This is so fantastic! I have the hardest time using hat pins and you made it look effortless! So glad your back…. and the creativity just never fades for you woman! Great card! Hope CHA was a blast! Sorry to hear that you have the flu at your house…hope you are all up and feeling better soon! 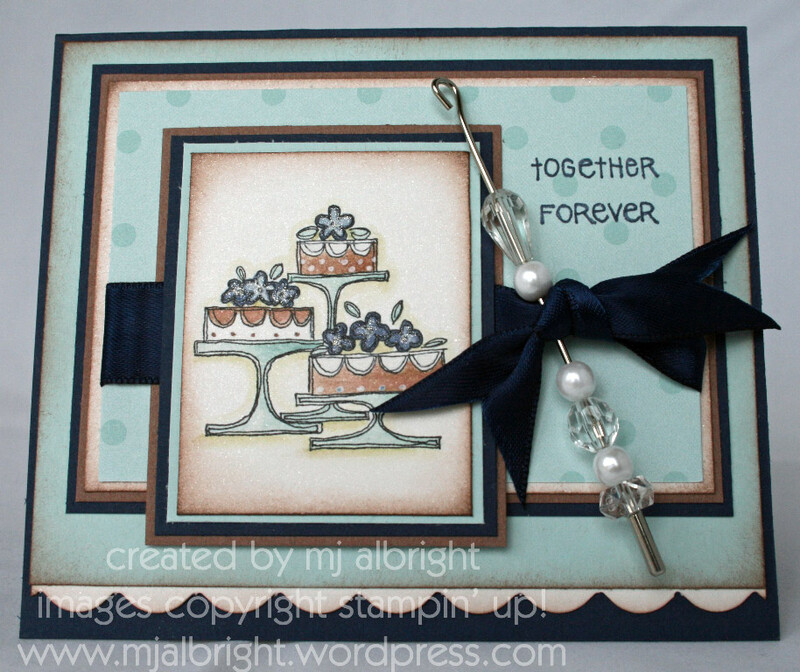 Your card is so cute…I love the color combo and how you colored the cakes! This is just beautiful! The coloring is fabulous. Hope you’re feeling better! Love this and the pin accent is perfect. Glad you are on the mend! This is gorgeous…so rich looking.